for creating a transfer-of-development-rights program. Chesterfield is poised to become the state’s first municipality outside of the Pinelands to add significantly to its already impressive farmland preserve, at little public cost, using a Transfer-of-Development-Rights program. The Township of Chesterfield, population 5,955, is located 10 miles southeast of Trenton in Northern Burlington County, one of the most important and agriculture-rich areas of the Garden State’s “farm belt.” The historic villages of Chesterfield, Crosswicks and Sykesville fall within the Township’s 21 square miles; the small-town charm epitomizes rural town living in New Jersey. The lands surrounding the villages remain fairly rural, as evidenced by the fact that more than 70 percent of the Township’s land area is enrolled in the state’s farmland assessment program. The New Jersey State Plan classifies the entire township as Rural (Planning Area 4), a designation that indicates the presence of highly productive farmland and prime farmland soils. The preservation of farmland and the retention of the community’s rural character have been a priority for Chesterfield since the 1970s. During this time, the Township created and adopted a Master Plan, which included a voluntary transfer of development credits (TDC) program. The program allowed for a density increase on a 200-acre site adjacent to the New Jersey Turnpike with the purchase of development credits from agricultural areas within the Township. Chesterfield has also been active in farmland easement purchase programs, which allow farmers to maintain ownership of the land while permanently restricting its use to agriculture. To date, the Township has succeeded in permanently preserving more than 30 percent of its total land area (4,261 acres) as farmland using a variety of local, county and state programs. Despite the Township’s best efforts to protect and preserve its agricultural resources, its convenient location near the crossroads of I-295, Route 130 and the New Jersey Turnpike made Chesterfield a target for development pressures. Scattered residential developments began to emerge along once-rural highway frontages, thus increasing the potential for conflict between new housing and existing farm operations. Between 1980 and 1990, the population in Chesterfield increased by 39 percent – nearly two times the increase over the previous decade and nearly eight times as fast as the statewide rate (5.2 percent). In 1989, the Legislature passed the Burlington County Transfer of Development Rights (TDR) Demonstration Act, thereby giving each of the 40 municipalities within the county a new tool for farmland preservation. TDR is based on the principle that the right to develop land can be severed (similar to an easement) from ownership of the land itself, and transferred to another property. Development is then shifted from one area within a community to another that is deemed more suitable for development. The strategy is to use private market forces, not just public acquisition funds, to promote conservation in high value natural, agricultural, and open space areas while encouraging smart growth in developed and developing sections of a community. With the new enabling legislation in hand, Chesterfield spent more than 10 years planning a new Transfer of Development Rights (TDR) program of its own. The Township’s 1997 Master Plan describes a TDR program whereby all of the Township’s future growth is directed to a designated “receiving area” while limiting development in the agricultural environs. The plan outlines a compact, mixed-use town center in the receiving area with a variety of housing types (including affordable housing), neighborhood shops and services, a school and other civic uses and recreational open space. Preserved farmland would surround the “planned village” and Chesterfield’s three historic hamlets. 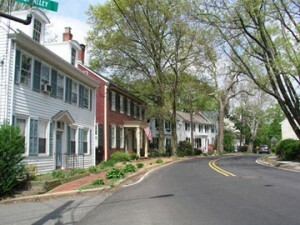 The planned village is unique in New Jersey in that it requires TDR credits transferred from the surrounding farmland, and is sized (at 1,300 dwelling units) and zoned to accommodate all of the Township’s remaining development capacity. Chesterfield did not stop with a plan, however. In 1998, the Township adopted a new Land Development Ordinance enabling TDR and changing the underlying zoning in the agricultural districts from 3.3-acre lots to 10-acre lots. A clustering option was added, giving developers a density bonus in exchange for preserving 50 percent of the property as open space. The State Planning Commission awarded “Center Designation” to Chesterfield’s planned village in 2000, which led to the receipt of a Smart Growth Planning Grant. The grant was used to commission the village’s conceptual design and architectural design standards. The Planning Board adopted these new standards and moved to amend the Township Master Plan accordingly. All of these plans and standards would have limited effect without the provision of sanitary sewer service to the developing receiving area. To that end, the Township worked with various state agencies to amend the Wastewater Management Plan and to secure sewer capacity from the State Corrections Facility nearby. In addition, Chesterfield invested more than $4 million of its own funds toward the construction of the force main and local pumping station, to ensure that the Receiving Area would be able to accommodate the higher densities necessary for the success of the TDR Program. None of these accomplishments would have been possible without the careful public planning process that took place from the start of this initiative. It was at numerous public meetings that the governing body demonstrated its concern for the property rights of local landowners along with its concern for the future of quality of life for all residents. Public support, along with thoughtful collaboration between the Township Committee, the Planning Board, the Township’s consulting planners, the Planning Board solicitor, the Township engineer and Burlington County’s Office of Land Use, were key to the implementation of the TDR program. Chesterfield’s vision will soon become reality. Fully 85 percent of the land in the Receiving Area is either controlled by major residential developers or in active contract negotiations – several have already purchased development credits that will preserve 243 acres. In addition, the Township has a commitment from developers to provide affordable housing through a mandatory set-aside, as well as contribute to the new road system and recreational facilities through cost-sharing programs. The Township itself has shown its commitment to the program as it has recently decided to site a new school within the Receiving Area; a walking distance away from the new housing that is proposed. In short, through its hard work and commitment to a vision, Chesterfield has created an effective TDR Program, one that can accommodate growth within the community without sacrificing its remaining open lands.